Okay. 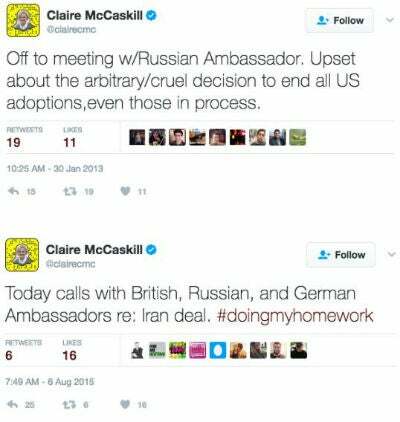 Claire McCaskill has tweeted out a bunch of things, she’s never talked to the Russians. Except Claire McCaskill apparently doesn’t know that what you write on Twitter is saved. And people have gone back and found two, maybe three different tweets by now where Claire McCaskill brags about being at social events and talking to the Russian ambassador! Yet here’s Claire McCaskill today saying, “Jeff Sessions needs to be fired, resigned, recused, whatever, ’cause he lied. He said he never talked to the Russians, and now we know he did!” Same thing could be said of Claire McCaskill. And that’s the way they’re gonna react to any evidence that we provide that shows Democrats have done it, too. Do you know how many Democrats met with Russians during the Iran negotiations? Thirty different Democrat senators met with Russians during Obama’s and John Kerry’s negotiations for a nuclear deal with the Iranians. Is that proper or improper? “What are the Democrats doing talking to the Russians about a nuclear deal with Iran?” we’re out there saying. It’s not gonna give Jeff Sessions a pass. I mean, it’s fun to point it out, and it’s great to have it on the record, but in terms of a strategy to push this back, it isn’t gonna work. It never has, and it never will. The focus, as far as the public is concerned, somebody needs to point out, beside the guy on the radio, that the real story here is the Democrat Party led by Barack Obama and Hillary and name the other names are trying to undermine and sabotage the Trump election victory and presidency and then explain why. RUSH: Claire McCaskill said in her tweet that everybody’s focusing on here: “I’ve been on the Armed Services Committee for 10 years. No call or meeting with Russian ambassador. Ambassadors call members of the Foreign Relations Committee.” Sessions was on that committee. So she’s saying, “I’ve been on that committee, too, and I never talked to Russian ambassadors.” Except she did. And she admitted so in two other tweets sent earlier that she’s forgotten about. And there’s even a photo now of her in the meeting with the Russian ambassador. Okay, so big whoop. What’s it gonna get us? Embarrass Claire McCaskill? We’ve already shown that can’t happen. It’s not gonna matter a hill of beans. This story is not about Claire McCaskill. It’s not about the Democrats. Let me ask you this, folks. What’s the allegation? Sessions met with the Russian ambassador, and they colluded. What did they collude about? Did Sessions say to the Russian ambassador, “Hey, look. We want you guys to find a way to hack Hillary’s emails and Podesta, and then we went you guys to give them to Julian Assange at WikiLeaks. We got a deal with Assange. He’s gonna publish whatever you find.” Is that what they want to claim happened here? What’s the collusion? Why can’t you talk to the Russian ambassador anyway? Where is the crime in that?